For adults and teenagers, correcting minor misalignment in your smile is efficient with Invisalign® clear braces. Orthodontic treatments improve the cosmetic appearance of teeth, providing patients with a uniform smile and renewed confidence. At Westford Dentistry, Dr. Narges Rashid and Dr. Joel Ross offer the Invisalign system to our patients in Westford, Littleton, and Chelmsford. Call us today to set up an appointment. Our dentists feel Invisalign is a great system product to recommend to those who have neglected their smile’s appearance over time. Whether you want to achieve a more youthful look or want to make a good impression, Invisalign discretely delivers a beautiful smile. This effective process allows you to remove the trays for convenience when eating, brushing, or flossing. For those with a public speaking event, being able to remove their orthodontic appliance grants them clearer speech, so they can be confident throughout their event. While traditional orthodontic methods use metal brackets and wires to shift crooked teeth into the correct positioning, many prefer the discreet and comfortable process of Invisalign. These clear braces use a series of customized, invisible trays to gently guide your smile to uniformity. Each set of trays is worn for two weeks, then replaced with the next set in the cycle. Intended results are better achieved when patients keep the trays in place for at least 22 hours a day. With a commitment to the recommended treatment path, Invisalign patients can expect desired results in as little as a few months, depending on the specific orthodontic needs of the case. We conduct a thorough consultation to determine if the patient is a good candidate. 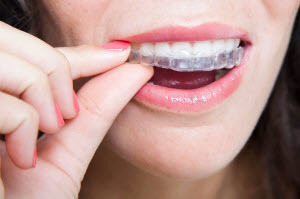 Invisalign is most beneficial to those with mild to moderate misalignment, so our office will refer you to a trusted local orthodontist if your smile has significant bite issues or crowding. We offer Invisalign Teen® for younger patients wanting an alternative to metal braces. These have the same benefits of the standard model, only with added space to account for growing teeth. These teenager-focused plans also include extra aligners in case they are lost, and include a tracking feature that shows how often they are being worn. While we offer this beneficial orthodontic option, we want to ensure your teenager is responsible enough to be compliant with the treatment process. Invisalign Express® is ideal for those with only slight misalignment, as the process utilizes five to ten series of trays rather than the 20 to 30 used with regular Invisalign. Patients opting for Invisalign Express can expect results in as little as 10 weeks. At Westford Dentistry, Dr. Rashid, Dr. Ross, prioritize transforming smiles to enhance your self-esteem. If you or your teenager have misaligned teeth and are interested in learning more about Invisalign clear braces, call our office in Westford today to schedule an appointment.